Here you will find our Pop Art gallery. The images here are brought to you by our suggested links. Please feel free to browse their extensive catalogue of pop art. Scroll down for more artists such as Roy Lichtenstein, Jasper Johns, David Hockney and Andy Warhol. 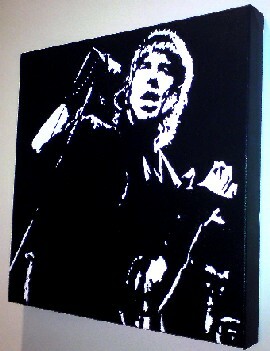 All of the pop art paintings below are hand painted by myself, the pop art expert - Chris Briggs. I absolutely love painting Pop Art and do it as a hobby more than anything else. But as is often the case in life, what starts as a hobby often turns into something else. Note: All paintings reduced from $99 to $80 for a limited time only. Amy Winehouse - This stunning piece of hand painted art will sit perfectly on any wall. Amy Winehouse really is the cult icon that people will be talking about in years to come. Only the best tripple primed 2inch deep box canvas is used and the finest Winsor acrylic paint. 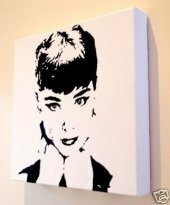 Audrey Hepburn - This stunning piece of hand painted art will sit perfectly on any wall. Audrey really is the cult icon that people will continue to talk about in years to come. Only the best tripple primed 2inch deep box canvas is used and the finest Winsor acrylic paint. 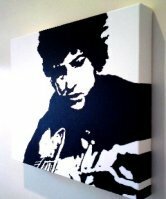 Bob Dylan - This stunning piece of hand painted art will sit perfectly on any wall. Bob Dylan really is the cult icon that people will continue to talk about in years to come. Only the best tripple primed 2inch deep box canvas is used and the finest Winsor acrylic paint. Duffy - This stunning piece of hand painted art will sit perfectly on any wall. Duffy really is the cult icon that people will be talking about in years to come. Only the best tripple primed 2inch deep box canvas is used and the finest Winsor acrylic paint. Axel Rose - This stunning piece of hand painted art will sit perfectly on any wall. Axel, the cult icon is extemely detailed - a must have for any fan. Only the best tripple primed 2inch deep box canvas is used and the finest Winsor acrylic paint. 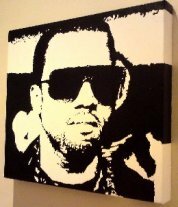 Kanye West - This stunning piece of hand painted art will sit perfectly on any wall. One of our most popular paintings. Kanye West really is the cult icon that people will be talking about in years to come. Only the best tripple primed 2inch deep box canvas is used and the finest Winsor acrylic paint. 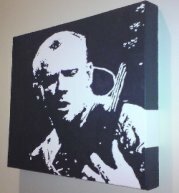 Flea - This stunning piece of hand painted art will sit perfectly on any wall. Flea looks amazing in this image. Only the best tripple primed 2inch deep box canvas is used and the finest Winsor acrylic paint. 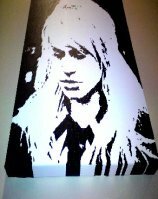 Anthony Kiedis - This stunning piece of hand painted art will sit perfectly on any wall. Anthony Kiedis really is the cult icon that people will be talking about for years to come. Only the best tripple primed 2inch deep box canvas is used and the finest Winsor acrylic paint. 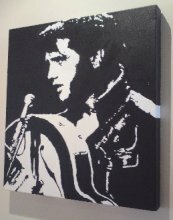 Elvis Presley- This stunning piece of hand painted art will sit perfectly on any wall. The king at his best here. Only the best tripple primed 2inch deep box canvas is used and the finest Winsor acrylic paint. Kings of Leon - This stunning piece of hand painted art will sit perfectly on any wall. Kings of Leon are one of the finest bands in the world today. Only the best tripple primed 2inch deep box canvas is used and the finest Winsor acrylic paint. 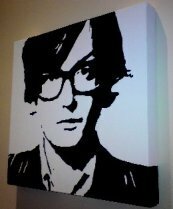 Jarvis Cocker - This stunning piece of hand painted art will sit perfectly on any wall. Jarvis with his incredible style really is a cult icon that people will be talking about in years to come. Only the best tripple primed 2inch deep box canvas is used and the finest Winsor acrylic paint. 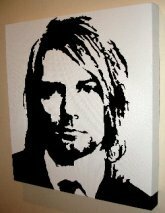 Kurt Cobain - This stunning piece of hand painted art will sit perfectly on any wall. The one and only Kurt looks great in this painting - very popular. Only the best tripple primed 2inch deep box canvas is used and the finest Winsor acrylic paint. Han Solo - This stunning piece of hand painted art will sit perfectly on any wall. Harrison ford looks great in this image. Only the best tripple primed 2inch deep box canvas is used and the finest Winsor acrylic paint. Che Guevara - This stunning piece of hand painted art will sit perfectly on any wall. Simple but extremely effective. Only the best tripple primed 2inch deep box canvas is used and the finest Winsor acrylic paint. 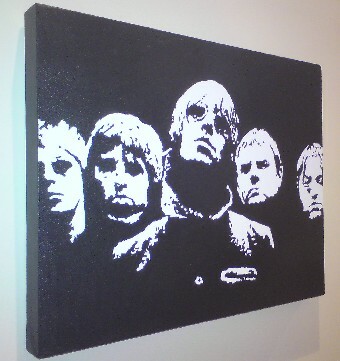 Oasis - This stunning piece of hand painted art will sit perfectly on any wall. Oasis ooze attitude in this image. Only the best tripple primed 2inch deep box canvas is used and the finest Winsor acrylic paint. 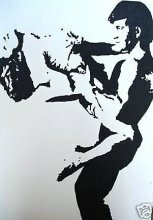 Dirty Dancing - This stunning piece of hand painted art will sit perfectly on any wall. This Dirty Dancing image is a complete classic - a great gift. Only the best tripple primed 2inch deep box canvas is used and the finest Winsor acrylic paint. 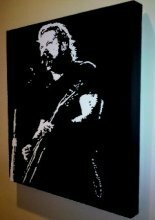 Metallica - This stunning piece of hand painted art will sit perfectly on any wall. James Hetfield really is the cult icon that people will be talking about in years to come. Only the best tripple primed 2inch deep box canvas is used and the finest Winsor acrylic paint. 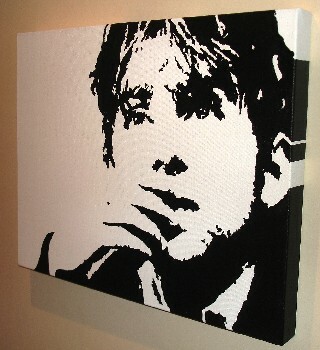 Damon Albarn - This stunning piece of hand painted art will sit perfectly on any wall. Damon Albarn of british band Blur and the Gorrillaz is truly sensational in this image. Only the best tripple primed 2inch deep box canvas is used and the finest Winsor acrylic paint. Monty Python - This stunning piece of hand painted art will sit perfectly on any wall. 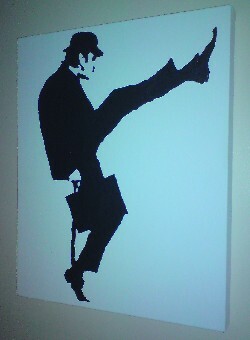 John Cleese in this classic Ministry of funny Walks poze looks great - again, a very popular image. Only the best tripple primed 2inch deep box canvas is used and the finest Winsor acrylic paint. 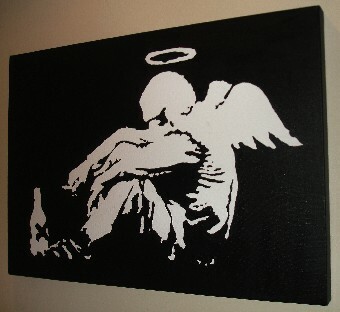 Banksy - Fallen Angel - This stunning piece of hand painted art will sit perfectly on any wall. Banksy replica painting - looks great and always raises a smile. Only the best tripple primed 2inch deep box canvas is used and the finest Winsor acrylic paint. 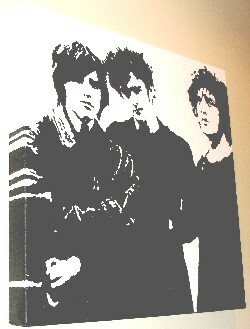 Black Rebel Motorcycle Club - This stunning piece of hand painted art will sit perfectly on any wall. Black Rebel Motorcycle Club are one of the coolest bands in the world. Only the best tripple primed 2inch deep box canvas is used and the finest Winsor acrylic paint.